“The flame has died! The fire is out!” said Peter Vardy, philosopher and former Heythrop vice principal, addressing a valedictory conference on 5 May this year. But, he continued, “from embers new fires can be lit”. It was an act of daring by the Jesuits to move Heythrop College in 1970 from the Oxfordshire countryside into the centre of London, first at Cavendish Square, then at Kensington Square. Here now were Jesuits running a self-standing constituent college of the secular University of London, teaching theology and philosophy to clerical and lay students alike with full academic freedom and their own Royal Charter. Surely, just what Jesuits should be doing. Jack Mahoney, one of those early movers and shakers and principal from 1976 to 1981, looks back at “a significant achievement”. Heythrop, he points out, has equipped many hundreds of lay men and lay women with publicly recognised university qualifications in theology, to enable them to serve the post-conciliar Church. 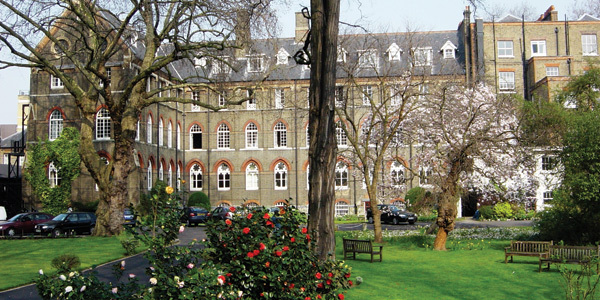 In 2009, at the request of the college’s governors, the Society purchased the Kensington Square building from the Sisters of the Assumption, so as to secure a valuable asset and provide rent-free accommodation. When crisis struck, the Jesuits made available several million more to tide the college over. But the higher education environment in Britain was being transformed out of all recognition. The government’s nostrum was competition – treating education, according to the critics, as a commodity in a commercial market. In 2012 English universities became able to charge prospective students tuition fees of up to £9,000 per annum. Facing debts of £27,000 or more when they graduated, students began to search for the best deals. “They became shoppers,” one member of staff at Heythrop says. They sought facilities and sports grounds that Heythrop could not supply, and increasingly favoured academic courses that would look good on their CVs and enhance their career prospects. Heythrop had only two closely aligned subjects to offer – theology and philosophy – albeit in innovative combinations. Meanwhile, the cap on student recruitment was progressively removed. The larger and richer universities began to hoover up candidates who they would not previously have been able to accommodate. Heythrop undergraduate enrolment dropped. These threats sparked an outburst of creative energy. Showing surprising agility Heythrop evolved from being largely teacher-led to being more research-intensive, and postgraduate and research student recruitment increased, even without much advertising. A vibrant new prospectus for undergraduates, “Curriculum 15”, was produced by the staff, and printed within glossy covers. But “Curriculum 15” was never distributed. Under the supervision of the Higher Education Funding Council for England and pressure from London University, the college had to announce that Heythrop’s undergraduate intake of 2015 would be its last. Everyone could see the situation might be terminal. The then chair of the Heythrop governors, Bill Moyes, a determined and thrusting executive, had a clear view of what he believed needed to be done. Heythrop must urgently seek a partnership with a larger and solvent university to achieve economies of scale. And he thought he knew where to look – St Mary’s University (SMU) in Twickenham. There was no alternative, he said. St Mary’s had originally been set up in Hammersmith in 1850 by the bishops of England and Wales as the first – and for a long time the only – Catholic teacher-training college for men. It moved to Strawberry Hill in the 1920s. Its specialities were education and sports. But its academic record did not glitter and its governance had recently come into question. After it was rebranded in 2014 and proclaimed itself the first Catholic university in England since the Reformation, the bishops of England and Wales regarded it as “theirs” and became aware that they had to find a way to upgrade it. The chancellor, Cardinal Vincent Nichols, invited Francis Campbell to step in. Campbell, a diplomat, had impressive qualifications. In 2005 he had become the first Catholic to be appointed British Ambassador to the Holy See. He got to know everyone in Rome and gave the British government and the Vatican unprecedented access to each other. Later he assisted Lord (Chris) Patten in the successful effort to rescue Pope Benedict XVI’s visit to Britain and make it the inspiring journey it became. Now in 2014 he accepted the challenge to pull St Mary’s up. On secondment from the Foreign Office, he was preparing to take over as university vice chancellor when he was approached by Heythrop. It was just what he needed, and he was excited. Heythrop had also put out feelers to Durham, King’s College London, Jesuit universities in the United States, and Oxford. None had come to anything. Negotiations with St Mary’s began after an initial period of exploration. At first they showed promise, but when Moyes had to step down as chair of governors in the autumn of 2014, for SMU some of the impetus departed. Gradually the talks became stickier for both parties. It would have been a shotgun marriage. “You’re only here because you’re broke,” one SMU representative was heard to remark. A well-informed Jesuit observer in Rome paints a picture of two sides who were suspicious of each other, one of them thinking, “You are not good enough for us”, and the other, “You think we are not good enough for you”. Fundamentally, it was a clash of cultures. Some SMU representatives thought the college was too freethinking, while Heythrop spokespeople doubted that their apostolate in the secular city would be able to be as before. After private exploration with the college, Campbell made a formal offer in March 2015. He wanted the central London site, and he wanted £50m. He also specified that Heythrop must adopt the strong financial and administrative controls that governed courses at St Mary’s. A partnership must not risk importing to SMU the structural instabilities that he saw as having contributed to Heythrop’s current weakness. Sweeney was one of the Heythrop negotiators. He remembers how disillusion crept up. “It wasn’t going to work,” he says. “I attended one consultation of Heythrop governors and trustees where opinion was almost united that this was not acceptable.” Meeting on 25 June 2015, the governors accepted that discussion with St Mary’s was over. The college would have to close in its present form, they said. That summer, the staff outlined alternative options. None gained approval. Then came a bolt from the blue. The initiative was taken by a redoubtable Sacred Heart sister, Dorothy Bell, who for 21 years had been principal of her order’s Digby Stuart College in Roehampton, and from 1989 to 2000 first a member of the Heythrop governors and then their chair. She had had a hand in the formation of Roehampton University from four colleges including Digby Stuart in 2004. Hearing of the breakdown in negotiations between Heythrop and St Mary’s, she went to the vice chancellor of Roehampton, Professor Paul O’Prey, and asked him for some ideas about how Heythrop could be saved. “I always try to do anything that Sr Dorothy asks of me,” he recalls. By comparison with the thorny negotiations with St Mary’s, the talks that followed between Heythrop and Roehampton went speedily. Three of the four colleges that make up the University of Roehampton are of Christian foundation; O’Prey invited Heythrop to become the fifth. He thought its ethos and outlook would fit. The distinctive college structure was embedded in the university’s governance, and the Jesuits could become part of it. A building on the university campus was due to become vacant so all the Jesuits would need to do would be to walk in. The top floor of the new library block that was being built would be reserved for the Society’s celebrated collection of 250,000 theological and philosophical volumes. By 25 April 2016, heads of terms had been agreed in principle by all participating parties – the Jesuit trustees, the Heythrop board, and Roehampton. O’Prey was prepared to take on upwards of 20 members of Heythrop’s staff and was even willing for Roehampton to shoulder Heythrop’s £15 million pensions deficit. All that was needed was for him as vice chancellor and Andrew Kennedy as chair of Heythrop governors to sign on the line. Attention had come to focus on the Bellarmine Institute, set up with fanfare by Heythrop in 2013 for an experimental period of five years, and due to expire in September 2018. The institute reanimated faculties for awarding pontifical degrees that Heythrop had enjoyed in Oxfordshire but which had lapsed in London. Jesuit scholastics and other members of religious orders and Allen Hall seminarians could study simultaneously for a civil BD or BA degree from the University of London and an ecclesiastical bachelor, licentiate or doctoral degree in sacred theology – STB, STL or STD – that would equip them for the priesthood or teaching in a seminary. The Bellarmine was under Heythrop’s wing but had its own identity. The Vatican’s Congregation for Catholic Education entrusted oversight of the degrees to the college’s academic board and governing body. The members of the institute were diligent and committed. Their courses piggybacked on the theology and philosophy that Heythrop was doing anyway, with certain additions designed to equip those who completed them for the priesthood. But an old fault line began to resurface: was Heythrop now a centre of learning and research, or was it, rather, still a seminary? As the clouds gathered, the Bellarmine became the tail that, in the opinion of some observers, wagged the dog right out of the scene. The Jesuit General in Rome, Adolfo Nicolás, did not want to give orders to the British province. It must make its own decisions. But he did specify that the Bellarmine as the “heart” of Heythrop must be preserved – a judgement shared by Cardinal Nichols, Archbishop of Westminster, who said the Bellarmine was “central”. The question became: could an ecclesiastical faculty find a safe haven in the secular university of Roehampton? Heythrop had flourished within the secular university of London, but the projected transfer to Roehampton made Cardinal Nichols and the bishops of England and Wales uneasy. Beneath the varied episcopal opinions, a core concern crystallised: there was no conviction that Catholic theology could be secured and sustained at Roehampton. The Jesuit Provincial in London, Fr Dermot Preston, envisaged that closure could become inevitable. At one point, in exasperation, he told Christopher Lamb of The Tablet: “Fundamentally, our task is not to run a university, it is to preach the good news.” One Jesuit university president in the United States slammed that copy of the paper down on the table. “So,” he said, referring to the number of Jesuit colleges and universities there, “twenty-eight of us are not doing a worthwhile job.” But perhaps in Preston’s outburst there was an echo of the Thirty-Second General Congregation of the Society, which in 1975 had committed Jesuits to the option for the poor and the pursuit of “faith and justice”. In Rome the General did not exclude the Roehampton option, but only if it was acceptable to the cardinal and the local hierarchy. So Preston enquired: did he have their support? Cardinal Nichols replied that they had reservations. First, he said, he and the bishops felt concern about the proposed governance structure of Heythrop within Roehampton in the longer term. It did not appear to them to offer a sufficiently reliable basis for decisions in a future environment that was likely to change. They did not see Heythrop at Roehampton occupying a position comparable to what it had held within the collegiate structure of London University. Therefore, secondly, they did not have confidence that the Bellarmine Institute could be established at Roehampton in such a way as to satisfy their expectations for the teaching and formation of the seminarians. Finally, the cardinal stressed the links between the Bishops’ Conference of England and Wales, the Catholic Education Service, and St Mary’s Catholic University. Roehampton was “a direct competitor” with St Mary’s. If the Jesuits joined Roehampton, they would be enabling it to claim the description “Catholic”, which would undermine the bishops’ own strategic direction. Preston pulled the plug. On 21 June 2016 he told the governors of Heythrop that he had ascertained that “a significant number of the hierarchy” were “clearly against” the Roehampton plan. Having fully briefed the trustees of the Society of Jesus, he was informing O’Prey that the negotiations with Roehampton must now formally end. There was a coda. On 22 July 2016 a post appeared on the St Mary’s website. It pictured Fr Philippe Bordeyne, the rector of the Institut Catholique de Paris (ICP) seated at a desk with the vice chancellor, Francis Campbell, during a St Mary’s graduation ceremony. On one side of them stood Cardinal Nichols, and on the other Bishop Richard Moth as chair of governors. Smiles of satisfaction all round. The caption announced that this was the signing of a formal memorandum that set out areas of understanding “including the awarding of ICP ecclesiastical degrees”. So St Mary’s was serving notice that it was ready to set up its own version of the Bellarmine Institute. The caption further disclosed that the signing ceremony was the culmination of a series of meetings that had begun in September 2015 – in other words, in parallel with the negotiations between Heythrop and Roehampton. Cardinal Nichols is a practised and astute church politician. As chancellor of St Mary’s as well as Archbishop of Westminster, he will have been well aware that he was dangerously close to being sucked into a glaring conflict of interest. His policy was therefore to correspond only with the Jesuit provincial. The closure of Heythrop, he repeatedly emphasised, was the province’s decision. Even a request from the chair of the Heythrop governors for a meeting was turned down on these grounds. So was a request from the staff. The Jesuit General’s point man in Rome for higher education, Michael Garanzini, an American priest who had had remarkable success in turning round the fortunes of Loyola University Chicago, holds firmly that whatever questionable decisions may have been taken, and however much Heythrop should have started its viability audit at least five years earlier, in the last analysis allowances must be made for tragic circumstances that were beyond the control of any of the immediate players. The Jesuits, under their new provincial Damian Howard, have moved to try to turn a disaster into an opportunity. They have set up an institute in their Oxford University residence, Campion Hall, for interdisciplinary and international study of environmental challenges in the light of the Pope’s encyclical Laudato Si’, and they have appointed a specialist in ecology and bioethics, Celia Deane-Drummond, professor of theology at Notre Dame in the United States, to lead it. Furthermore, the Jesuits have plans to open a new base in central London where they could give evening lecture series that would be open to all-comers. They have called time on their extended procrastination about the future of the college library by sending the books and periodicals to a depository in Ruislip, and arranging for the collection to be electronically catalogued so that any member of the Senate House Library can call up a volume. One development at least attests to O’Prey’s generosity and vision. Seven previous Heythrop staff are now engaged as teachers and researchers, full-time or part-time, at Roehampton. Tina Beattie, professor at Digby Stuart, has high hopes of what a new centre for Catholic studies may achieve with this additional high-calibre support. But the loss of Heythrop leaves a hole in Catholic higher education and innovative research that cannot be covered over. A favourite tree, however well seasoned, can be cut down in an hour or two. To plant it, however, and to grow and nurture it, takes – in the case of Heythrop’s whole history – more than 400 years. A tree can be trimmed, of course – if necessary, radically. Garanzini is critical of the prevalent assumption that the Heythrop operation had to be saved in its entirety. John Wilkins is a former editor of The Tablet.